In the latest installment of the beloved and best-selling No. 1 Ladies’ Detective Agency series, Precious Ramotswe learns valuable lessons about first impressions and forgiveness. Mr. Polopetsi tells Mma Ramotswe and Mma Makutsi a troubling story about a woman who has been wrongly dismissed from her job. Never one to let an injustice go unanswered, Mma Ramotswe begins to investigate, but she soon discovers that the case is more complicated than she initially suspected. Other surprises await our intrepid proprietress. Mma Ramotswe happens to hear of a local nurse named Mingie Ramotswe. Who is this mystery lady? Other surprises await our intrepid proprietress. Mma Ramotswe happens to hear of a local nurse named Mingie Ramotswe. Who is this mystery lady? Then, she finds out that an unpleasant figure from her past has recently been spotted in town. With the generosity and good humor that guide all her endeavors, Mma Ramotswe will untangle these questions, ultimately bringing to light important truths about friendship and family—both the one you’re born with and the one you choose. Alexander McCall Smith is the author of the No. 1 Ladies’ Detective Agency novels and of a number of other series and stand-alone books. His works have been translated into more than forty languages and have been best sellers throughout the world. He lives in Scotland. 1. There are many issues that trouble Mma Ramotswe in this novel. Who does she turn to in her time of need, and for which different purposes? Do you talk to different people about different types of problems? 2. Mma Ramotswe believes in the functionality of things. As long as her tiny white van still works, and he traditionally built dresses are of good quality and comfortable, she does not see the need to replace them. Mr. J.L.B. Matekoni keeps his boots and clothing a little longer than perhaps he should. Mma Makutsi (now that she is married to Phuti Radiphuti), buys new clothes—especially shoes—as fashions change. Do you tend to hold on to your possessions as long as they are functional, or do you change with the seasons? 3. Puso makes a map of the world. He makes Botswana “as big as South America,” (p. 39). Do you think we all see of our own countries as big as we can, and why? 4. When Mr. Polopetsi brings a new “case” to the No. 1 Ladies’ Detective Agency, why do you think Mma Ramotswe takes up the issue, knowing that it might be a ‘he said/she said’ case? 5. Mma Makutsi is quick to make a point, and sees her life through a very distinctive worldview. While she has a wonderful heart, it is sometimes hard for Precious to maneuver around Grace’s hard opinions. How are Rra Polopetsi and Charlie good foils for her character? 6. When Mma Ramotswe learns of another person with her surname in Mochudi, she is surprised because she thought she knew all of the people with her name in the city. What would you do if you met someone with your last name, living so close to you? 7. Precious learns from Mma Potokwane that Note (her abusive ex-husband) is in town. This troubles her, and yet she doesn’t share her problems with her family or friends. Why is this problem different from the other issues Mma Ramotswe regularly faces? 8. Precious is distracted from Charity’s case by two things: the other woman who shares her name, and the presence of Note in town. Discuss how she deals with these issues, and how you think you would. 9. Charity’s mother is quick to say that her daughter is impulsive and headstrong. Why do you think Charity’s mother went against her daughter, despite what Charity said to Mma Ramotswe? 10. When Precious realizes she has a sister, she is shocked and excited. When she understands her sister’s age doesn’t fit into her timeline of life, she doesn’t know how to feel. Would you be able to keep your feelings about a sibling separate from a beloved parent? 11. 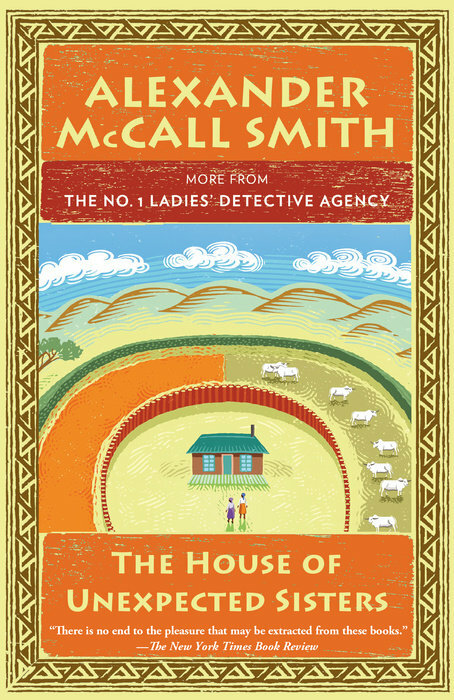 Mma Ramotswe wants to love her sister, but “she never tired of hearing about her father—that great man, that unrivalled judge of cattle, her daddy, as she called him, and of whom she thought at some point every day, every single day, and whom she had loved with all her heart” (p. 30). Have you ever heard something about your parents that you would prefer not to know, or do you think, as you age, it is important to know more about them as adults? 12. Precious tells Mr. J.L.B. Matekoni that her heart is broken over her father’s betrayal of her mother. How does she continue to see the world, despite an undoing of what she’s always known to be true? 13. Mma Ramotswe remembers something her detective mentor Clovis Anderson said: “‘Emotions have the same effect as a magnet has on a compass.’ . . . Yes, that was it. The needle swings around in a confusing way and you lose direction” (p.58). Where do you think Precious lost direction in this story, and how did she get back on course? 14. Precious gets a break in the case when she visits Mma Gopolang. Not only are they able to resolve the problem of Charity’s dismissal, but they are able to solve the issue of Rra Gopolang’s affair. Again Clovis Anderson comes to Mma Ramotswe’s mind, “Never make the mistake of thinking that things are what they seem to be—often they are not” (p. 206). Have you used such advice in your life? 15. Sometimes things are not what they appear in life. Rra Gopolang is not cheating on his wife, and Obed Ramotswe did not cheat on Precious’s mother. Why do you think it is sometimes easier to believe of the worst in people, rather than finding another explanation? 16. Precious’s heart is healed when she discovers her sister is not a product of Obed’s infidelity. Charity gets her job back, and everything returns to as it should be. Even Note gets a reprieve when Mma Potokwane explains that he is getting marries to a good woman, and has expressed regret for the way he treated Precious in the past. “[S]ometimes it’s not easy to say the things we need to say. It is not easy—maybe even impossible—because we are weak. All of us. We try to be strong, but we are weak.” She paused. “If I may say so, Mma—that is well known” (p. 226). When have you have a similar situation, or have you been the cause of it?